– the number of calls to the Nucleonica webservers has been considerably reduced giving the impression of a “standalone” application. – a new point and click feature allows zooming into to particular nuclides or regions of the nuclide chart in addition to standard zoom-in zoom-out buttons. – the new version of the Nuclide Explorer has been tested on Firefox, Chrome and IE browsers. We strongly advise using Firefox or Chrome to view this Chart. 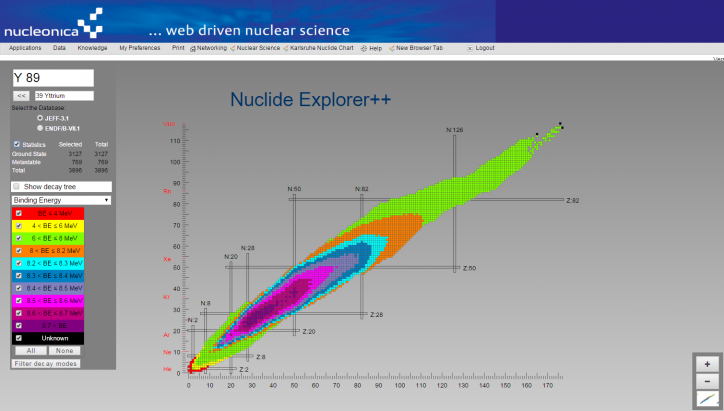 – the application has been optimised for viewing different nuclear datafiles. Currently the JEFF3.1 and ENDF/B-VII.1 can be viewed. – statistics on the total number of ground and metastable states and for selected operations (e.g. no. nuclides in a decay tree) are given. – Show Decay feature allows the user to see the decay tree or highlight daughter nuclides of a selected nuclide in the chart. – the filter decay mode panel has been improved to give information on the total number of nuclides with particular decay modes. – a right mouse click leads to a new context sensitive menu which can be use to launch other Nucleonica applications (e.g. Decay Engine, Dosimetry & Shielding++, etc.) for the selected nuclide.